The Quest for Height: Grow Taller | Increase Height | Bone Size: Why don't people with Osteoarhritis grow taller? Osteoarthritis involves endochondral ossification. If endochondral ossification results in increased height then why doesn't osteoarthritis increase height? A main difference is the environment, the growth plates are inside a long bone whereas the endochondral ossification in osteoarthritis occurs in the synovial joint. Height growth is not a symptom of osteoarthritis, however joint deformation is which indicates growth. A likely possibility is that an eventual outcome of osteoarthritis is that the ends of the bones bump into each other. The contact between bones could prevent further growth. Another possibility for the bone to bone contact is gravity pushing the bones together with a lack of cartilage to cushion the bones from happening. It's possible that height growth is an unreported symptom of osteoarthritis. But, if osteoarthritis could cause height growth then it could lead to a liability issue if doctors failed to list it as a symptom. So why doesn't osteoarthritis make you taller? Normal cartilage is a lot like endochondral ossification anyways with four zones including: superficial, medial, deep, and calcified cartilage. People have often stated that calcified cartilage is not bone. The cartilage in the synovial joint may undergo all stages of endochondral ossification except for the ossification phase. Since this stage only involves calcified cartilage in the synovial joint rather than ossification like in the growth plate you do not grow taller. This may mean that osteoblasts are of key importance to height growth as other parts of the phases of endochondral ossification like ECM degradation and chondrocyte apoptosis still likely occur in articular artilage. Chondrocyte hypertrophy is a part of osteoarthritis. Chondrocytes do not hypertrophy when collagen is prevented from degradation. The degradation of collagen changes the osmotic gradient and results in chondrocyte apoptosis. TGF-Beta1 is important for cartilage homeostasis and deregulation of it's signaling is part of osteoarthritis. Chondrocyte cultures under TGF-Beta1 will usually maintain a chondrogenic phenotype whereas chondrocyte cultures exposed to BMP-2 will undergo endochondral ossification. Endoglin enhances the Smad 1/5 phosphorylation which promote mineralization whereas they inhibit Smad 2 phosphorylation which encourages more Type II Collagen production. Endoglin has been associated with osteoarthritis. Therefore, it is not likely a lack of involvement of chemical signaling that prevents chondrocytes from fully undergoing an osteogenic phenotype. Remember that bone begins as a completely cartilagenous template and yet manages to become bone. Therefore, even though chondrocytes in articular cartilage are not surrounded by bone like in the growth plate they should still be able to become bone. 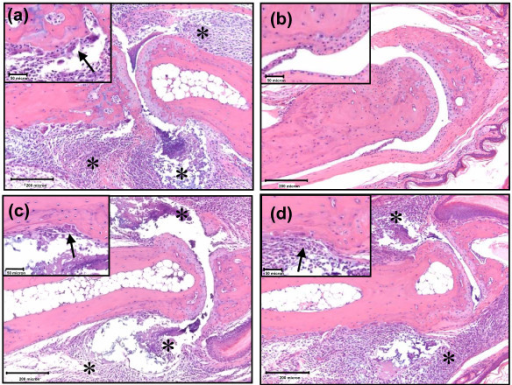 The interplay of MMP-9, osteoclasts, and VEGF are essential for endochondral ossification. In Osteoarthritis, cartilage degrades usually by way of MMP-13 rather than osteoclasts. This distinction could be a key reason why osteoarthritis doesn't increase height. Development of articular cartilage and the metaphyseal growth plate: the localization of TRAP cells, VEGF, and endostatin. "During long bone development the original cartilaginous model in mammals is replaced by bone, but at the long bone endings the avascular articular cartilage remains. Before the articular cartilage attains structural maturity it undergoes reorganization, and molecules such as vascular endothelial growth factor (VEGF) and endostatin could be involved in this process. VEGF attracts blood vessels, whereas endostatin blocks their formation. The present study therefore focused on the spatio-temporal localization of these two molecules during the development of the articular cartilage. Furthermore, we investigated the distribution of the chondro/osteoclasts at the chondro-osseous junction of the articular cartilage with the subchondral bone. Mice served as our animal model, and we examined several postnatal stages of the femur starting with week (W) 4. during the formation of the articular cartilage, VEGF and endostatin had an overlapping localization. The former molecule was, however, down-regulated, whereas the latter was uniformly intensely localized until W12[So VEGF is downregulated in articular cartilage making it less vascular]. At the chondro-osseous junction, the number of tartrate-resistant acid phosphatase (TRAP)-positive chondro/osteoclasts declined with increasing age[TRAP is expressed by chondroclasts and osteoclasts but decreased with age. Meaning that lower osteoclast levels could be a reason why you don't grow taller with osteoarthritis]. Until W3 the articular cartilage was not well organized but at W8 it appeared structurally mature. At that time only a few TRAP cells were present, indicative of a low resorptive activity at the chondro-osseous junction. Subsequently, we examined the metaphyseal growth plate that is closed when skeletal maturity is attained. Within its hypertrophic zone, localization of endostatin and VEGF was observed until W6 and W8, respectively. At the chondro-osseous junction of the growth plate, chondro/osteoclasts remained numerous until W12 to allow for its complete resorption[growth plates had many osteoclasts]. According to former findings, VEGF is critical for a normal skeleton development, whereas endostatin has almost no effect on this process. In conclusion, our findings suggest that both VEGF and endostatin play a role in the structural reorganization of the articular cartilage and endostatin may be involved in the maintenance of its avascularity. In the growth plate, however, endostatin does not appear to counteract VEGF, allowing vascular invasion of hypertrophic cartilage and bone growth." Osteoclasts are important for height growth and an osteoclast inhibitor Alendronate has been shown to reduce height growth. "Angiogenesis, the formation of new blood vessels from preexisting capillaries, is triggered by the vascular endothelial growth factor (VEGF), and with the vessels, bone-forming cells and the chondro- as well as osteoclasts are recruited. In doing so, the cartilage matrix is remodelled, and newly formed bone leads to the establishment of the diaphyseal primary ossification centre (POC) followed by the epiphyseal secondary ossification centre (SOC)"<-Due to an insufficient supply of osteoclasts, the cartilage matrix is not remodeled in such a way as to increase height.
" Principally, the adult articular cartilage shows no evidence of hypertrophy. It is a stable avascular tissue, and VEGF is down-regulated during its development[lack of VEGF could be another reason for lack of complete endochondral ossification in cartilage] and nearly undetectable under normal conditions. Only in patients suffering from osteoarthritis is the angiogenic factor up-regulated in the joint system[however VEGF becomes present during osteoarthritis so VEGF could not be involved in the lack of osteoarthritic height growth], and during the progression of this degenerative disease, vessels from the subchondral bone occasionally grow into the calcified zone of the articular cartilage"
"Articular cartilage is not well structured [during early development], and numerous blood vessels as well as chondro/osteoclasts invade the mineralized hypertrophic layers indicative of an intense tissue resorption and epiphyseal bone formation. The articular cartilage represents a surface growth plate with a high level of activity at this developmental time. "<-articular cartilage starts out like a growth plate. Decline of VEGF and osteoclast activity being a key reason for lack of growth plate function. So, the reason that people with osteoarthritis don't grow taller may be due to a lack of osteoclast activity. Though VEGF helps recruit osteoclasts, there are not enough TRAP-positive osteoclasts to recruit. Remodeling by osteoclasts may play a key role in height growth. Osteoclasts may physically alter the growth plate in some way as to make you taller. If degradation of type II collagen was the important part of height growth so as to alter the osmotic gradient then MMP-13 would be enough to increase height and MMP-13 is present in osteoarthritis. However, there does seem to be an upregulation of osteoclasts in normal arthritis. "There is emerging interest for osteoclasts as key players in the erosive and inflammatory events leading to joint destruction in chronic arthritis. In fact, chronic inflammatory joint diseases such as psoriatic arthritis and rheumatoid arthritis are often characterized by destruction of juxta-articular bone and erosions due to the elevated activity of osteoclasts, which are involved in bone resorption. The main step in inflammatory bone erosion is an imbalance between bone resorption and bone formation: osteoclast formation is enhanced by proinflammatory cytokines such as TNF-α, IL-1β, and IL-17 and is not balanced by increased activity of bone-forming osteoblasts. T-cells, stromal cells, and synoviocytes enhance osteoclast formation via expression of RANKL and, under pathologic conditions, of proinflammatory cytokines. In rheumatoid arthritis, accumulation of osteoclasts in synovial tissues and their activation associated with osteoclastogenic cytokines and chemokines at cartilage erosion sites suggest that they could be usefully selected as therapeutic target. In particular, in consideration of the primary role of RANKL and TNF-α in osteoclastogenesis, the control of the production of RANKL and the inhibition of TNF-α represent important strategies for reducing bone damage in this disease." This is regular arthritis however, maybe in the presence of VEGF(osteoarthritis) and Osteoclasts(regular arthritis), you would grow taller.
" A physical contact of precursor cells with osteoblasts or other specific mesenchymal cells, such as stromal or synovial cells, is essential for osteoclastogenesis"<-Synovial joint cells have contact with synovial mesenchymal cells so osteoclastogenesis must be possible in the synovial joint. Subchondral bone loss following orthodontically induced cartilage degradation in the mandibular condyles of rats. "Osteoarthritis (OA) is a degenerative joint disease generally characterized by progressive cartilage degradation and subchondral bone changes. Subchondral bone changes have been proposed to initiate or accompany with cartilage degradation in OA. 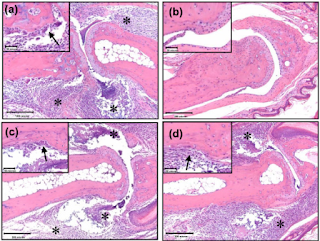 The purpose of this study was to characterize cartilage damage, subchondral bone remodeling, and the possible mechanism involved in these morphological changes in our reported rat model with OA-like lesions in the mandibular condyle. In experimental groups, the dental occlusion was orthodontically disturbed. By histological analysis, transmission electron microscopy (TEM), micro-CT scanning and serum tests, changes in condylar cartilage and subchondral bone were analyzed at 8 and 12 weeks after treatment. The mRNA and protein levels of bone pro-resorptive and pro-formative factors by chondrocytes were investigated. Increased degraded cartilage areas and obvious cartilage calcification were observed in 8- and 12-week treated (EXP) groups compared to the age-matched controls. Subchondral bone loss, characterized as decreased bone mineral density (BMD), bone volume fraction (BV/TV) and trabecular thickness (Tb.Th), but increased trabecular separation (Tb.Sp), was observed in the 12-week but not the 8-week EXP group, respectively, versus their age-matched controls. The subchondral bone loss in the 12-week EXP group was accompanied with decreased new bone formation rate, but increased serum carboxy terminal telopeptides (CTXs), and increased osteoclast numbers and proportion of surface area in the subchondral bone regions. Increased mRNA and protein levels of M-CSF, VEGF, RUNX and RANKL/OPG ratio[So VEGF increased as well], but decreased OPG, were found in condylar cartilage in the 12-week EXP group versus its age-matched controls, and those of RANKL/OPG ratios were significantly higher in the 12-week EXP group than the 8-week EXP. In addition, increased mRNA levels of VEGF, RUNX and RANKL/OPG ratio, but decreased OPG, were also found in condylar cartilage in the 8-week EXP group versus its age-matched controls (All P<0.05). This study demonstrated that obvious subchondral bone loss followed cartilage degradation in the mandibular condyles in the present rat models and suggested that the imbalance of chondrocyte-secreted regulatory factors within the degraded cartilage may play a role in the osteoclastogenesis, and thus leading to the subchondral bone loss in OA." Now it could be that the osteoclasts were active at the wrong area. The osteoclasts were reabsorbing at the subchondral plate rather than in the hypertrophic zone of the articular cartilage. "articular cartilage is non-vascularized and does not contain mononuclear phagocytes, apoptotic products would not be cleared out effectively, leading to the excessive inorganic pyrophosphate and calcium precipitate within the cartilage"<-This could be the key to way you don't grow taller in osteoarthritis. Chondrocytes undergo apoptosis but their products are not cleared out effectively leading to calcium precipitate(which causes calcified cartilage) but not growing taller as maybe the apoptotic byproducts inhibit bone formation. However, could the presence of VEGF in this study enable for the cleaning of these apoptotic products. In the study referenced, by this statement, normal articular cartilage was used. In this study, the subchondral bone loss study, the bones do look bigger and taller. However, no official measurements were made. An increase in bone mineral density for example could be caused by longitudinal bone growth as the bone is now spread over a larger area. An increase in trabecular spacing supports this theory as there is now a larger bone for the same number of trabeculae. The reason that people with osteoarthritis don't grow taller involves VEGF and osteoclasts. Lack of osteoclasts(but having VEGF present) seems to cause osteoarthritis whereas lack of VEGF(with osteoclasts present) causes degenerative arthritis. But the presence of both VEGF and osteoclasts did not clearly lead to bone growth in the one study that had both factors(although bone growth is still possible but not measured). The presence of cartilage calcification in the subchondral bone study indicates that the apoptotic byproducts were not disposed of efficiently despite the presence of VEGF. Maybe the increase of VEGF was not sufficient and higher VEGF levels would result in an increase in height or something else is needed to get rid of those byproducts that may inhibit the final stages of endochondral ossification and height growth. The turnover of mineralized growth plate cartilage into bone may be regulated by osteocytes. "During endochondral ossification, growth plate cartilage is replaced with bone. Mineralized cartilage matrix is resorbed by osteoclasts, and new bone tissue is formed by osteoblasts. As mineralized cartilage does not contain any cells, it is unclear how this process is regulated. We hypothesize that, in analogy with bone remodeling, osteoclast and osteoblast activity are regulated by osteocytes[articular cartilage does not have nearby osteocytes to regulate this activity], in response to mechanical loading. Since the cartilage does not contain osteocytes, this means that cartilage turnover during endochondral ossification would be regulated by the adjacent bone tissue. We investigated this hypothesis with an established computational bone adaptation model. In this model, osteocytes stimulate osteoblastic bone formation in response to the mechanical bone tissue loading. Osteoclasts resorb bone near randomly occurring microcracks that are assumed to block osteocyte signals. We used finite element modeling to evaluate our hypothesis in a 2D-domain representing part of the growth plate and adjacent bone. Cartilage was added at a constant physiological rate to simulate growth. Simulations showed that osteocyte signals from neighboring bone were sufficient for successful cartilage turnover, since equilibrium between cartilage remodeling and growth was obtained. Furthermore, there was good agreement between simulated bone structures and rat tibia histology, and the development of the trabecular architecture resembled that of infant long bones. Additionally, prohibiting osteoclast invasion resulted in thickened mineralized cartilage, similar to observations in a knock-out mouse model. We therefore conclude that it is well possible that osteocytes regulate the turnover of mineralized growth plate cartilage." So osteocytes may be needed for height growth as well as VEGF and osteoclasts.
" It is known that in certain situations, osteoblasts seem capable of forming bone in the absence of osteocyte signals, for example when the first osteoid is synthesized in the anlage. Such independent osteoblast activity could be involved during endochondral ossification close to the epiphyseal plate as well. However, in the presence of adjacent osteocytes, osteoblast activity seems to become regulated by osteocyte signals. "<-Since bone begins as a cartilagenous template there are no osteocytes. However, endochondral ossification seems to occur in that stage. However, at that stage maybe purely remodeling occurs and not actual height growth until osteocytes are in place to regulate it.
" the simulated development of the trabecular architecture with increasing distance from the growth plate resembled that of infant bones"<-So, the articular cartilage may be too far away to receive signals from the osteocytes thus limiting it's growth potential. Note that the factors inhibiting height growth in osteoarthritis(or other -arthritis) do not affect LSJL like osteocytes, VEGF, and osteoclasts. Alterations to the subchondral bone architecture during osteoarthritis: bone adaptation versus endochondral bone formation. "Osteoarthritis (OA) is characterized by loss of cartilage and alterations in subchondral bone architecture. Changes in cartilage and bone tissue occur simultaneously and are spatially correlated, indicating that they are probably related. We investigated two hypotheses regarding this relationship. According to the first hypothesis, both wear and tear changes in cartilage, and remodeling changes in bone are a result of abnormal loading conditions. According to the second hypothesis, loss of cartilage and changes in bone architecture result from endochondral ossification. With an established bone adaptation model, we simulated adaptation to high load and endochondral ossification, and investigated whether alterations in bone architecture between these conditions were different. In addition, we analyzed bone structure differences between human bone samples with increasing degrees of OA, and compared these data to the simulation results. The simulation of endochondral ossification led to a more refined structure, with a higher number of trabeculae in agreement with the finding of a higher trabecular number in osteochondral plugs with severe OA. Furthermore, endochondral ossification could explain the presence of a "double subchondral plate" which we found in some human bone samples. However, endochondral ossification could not explain the increase in bone volume fraction that we observed, whereas adaptation to high loading could. Based on the simulation and experimental data, we postulate that both endochondral ossification and adaptation to high load may contribute to OA bone structural changes, while both wear and tear and the replacement of mineralized cartilage with bone tissue may contribute cartilage thinning." "the highest increase in bone volume is found near the bone-cartilage interface"
"Throughout life, articular cartilage is continuously being replaced with bone. Normally this process is slow, but in OA the cartilage turnover rate increases"
"This could explain why advancement of the tidemark, which indicates the junction between articular and mineralized cartilage, is observed in OA"
"Vascularization of mineralized cartilage has been proposed as the inductive component of endochondral ossification in OA"
"In a study on human bone, the number of blood vessels in mineralized cartilage was shown to decrease from adolescence until the age of 60, after which it increased again, and a similar pattern was found for cartilage remodeling"
"During the simulations of endochondral ossification, the articular cartilage was almost completely replaced with bone. For both endochondral ossification simulations, mineralized cartilage remnants persisted in the bone tissue as well as the initial subchondral plate." "For adaptation to high load, bone volume fraction and trabecular thickness increased compared to baseline, while trabecular number and separation decreased. For endochondral ossification under normal loading, bone volume fraction and trabecular thickness decreased, while trabecular number and separation increased. For endochondral ossification combined with high load, bone volume fraction and trabecular number increased, and trabecular thickness and separation decreased." "Endochondral ossification can only contribute significantly to alterations in bone architecture underneath areas with significant loss of cartilage thickness, at a location close to the cartilage. As we observed the increase in trabecular number for samples with full-thickness cartilage degeneration (ICRS 4) between 0 and 2 mm depth, we postulate that this increase may have been caused by endochondral ossification." Optical tomographic imaging discriminates between disease-modifying anti-rheumatic drug (DMARD) and non-DMARD efficacy in collagen antibody-induced arthritis. "Histology of treated and untreated collagen antibody-induced arthritis mice. (a) Collagen antibody-induced arthritis (CAIA)/vehicle mouse interphalangeal joint (10× magnification) showing expansion of synovial and extraarticular tissues, as well as the joint spaces, by edema(swelling from fluid accumulation) and inflammatory cell infiltrates (asterisks). Inset: higher magnification (40×) view of osteoclast-mediated bone resorption (arrow). (b) Prednisolone-treated mouse interphalangeal joint (10× magnification) with normal synovial tissue and cartilage. Inset: high magnification view (40×) showing absence of bone resorption. (c) Celecoxib-treated mouse interphalangeal joint (10× magnification) also with inflammatory cells in the joint capsule, synovium, and joint space (asterisks). Inset: higher magnification (40×) view of osteoclast-mediated bone resorption (arrow). (d) p38 mitogen-activated protein kinase (MAPK) inhibitor-treated mouse interphalangeal joint (10× magnification) with mildly decreased edema and inflammation in the joint space (asterisks) as compared with vehicle and celecoxib groups. Inset: higher magnification (40×) view showing inflammation (arrow) but minimal apparent osteoclast-mediated bone resorption. Histology assessment is representative of two separate experiments. " Intermittent hydrostatic pressure inhibits matrix metalloproteinase and pro-inflammatory mediator release from human osteoarthritic chondrocytes in vitro. "Human osteoarthritic articular chondrocytes were isolated and cultured as primary high-density monolayers. For testing, chondrocyte cultures were transferred to serum-free medium and maintained without loading or with exposure to intermittent hydrostatic pressure (IHP) at 10 MPa at a frequency of 1 Hz for periods of 6, 12 and 24 h. Levels of matrix metalloproteinase-2, -9 (MMP-2, -9), tissue inhibitor of metalloproteinase-1 (TIMP-1), and the pro-inflammatory mediators, interleukin-6 (IL-6) and monocyte chemoattractant protein-1 (MCP-1), released into the culture medium were assessed by ELISA. Matrix metalloproteinase activity was confirmed by zymographic analysis. RESULTS: In the absence of IHP, levels of MMP-2, TIMP-1, IL-6, and MCP-1 in the chondrocyte culture medium increased in a time-dependent manner. Application of IHP decreased MMP-2 levels at all time periods tested, relative to unloaded control cultures maintained for the same time periods. Although 84/82 kDa bands were faintly detectable by zymography, MMP-9 levels were not quantifiable in medium from loaded or unloaded cultures by ELISA. TIMP-1 levels were not altered in response to IHP at any time period tested. IL-6 and MCP-1 levels decreased in cultures exposed to IHP at 12 and 24 h, relative to unloaded control cultures maintained for the same time periods. CONCLUSION: IHP decreased release of MMP-2, IL-6 and MCP-1 by osteoarthritic chondrocytes in vitro suggesting that pressure influences cartilage stability by modulating chondrocyte expression of these degradative and pro-inflammatory proteins in vivo." Hydostatic pressure in the adult articular cartilage may inhibit results there too. "IL-6 is associated with bone remodeling activity, depression of chondrocyte proteoglycan synthesis, and stimulation of interleukin-1 (IL-1) dependent proteoglycan degradation." "excessively high levels of hydrostatic pressure (50 MPa) increase heat shock protein-70 expression and matrix enzymes"
When you train, do you do Squat Lifts with very heavy weights?